We've teamed up again with the fabulously knowledgeable and energetic Martin of Go Foraging fame to offer 2 workshops this Summer. The first on Saturday 11th May // Saturday 3rd August. Starting at 9:30am at the pub for a quick cup of tea/coffee and a chance for everyone to get acquainted, then we'll head off to one of Martin's favourite foraging spots where we will be identifying, picking and eating a number of delicious edibles that present themselves along the way. There will be discussions about seasonal eating and the nutritional values and medicinal use of plants. We will also look at the conservation of species and their habitats, what to take and what to leave. And of course, there’s use and storage of wild food, recipes and lots, lots more. The cost of the day will be £55. Come on your own or in a group, all welcome! Spaces are limited so email us to book your spot now. We are delighted to read that Marina O’Loughlin, the legendary food critic (currently for The Times) has been to the Kenny recently. No one knows for sure what she looks like so we had no flippin’ clue until the paper came out this weekend (23rd March). Are we chuffed or what?! So darned chuffed. O’ Loughlin joined us one weekday afternoon for our Lunch Offer (2 Courses £12, 3 Courses £15) and enjoyed our Devilled Duck Kidneys and Mushrooms on Toast, followed by the Cod Burger and Chips. Join us on Thursday 28th March for the next in our special events series. We are celebrating the magnificent, the traditional, the British institution, The Pub Classic. It’ll be your old favourites re-imagined for a five course tasting menu of hearty, humble food. Menu £40 - reservations now open. Is this the best day of the year? Definitely maybe. Any holiday that is specifically geared around eating is up there as the best in our book. We’ll be serving pancakes, savory and sweet, all day long on Tuesday March 5th. Join us for our Pork Nose to Tail tasting evening 28.02.19 // Here’s the full menu for the event // Meat from @originbutchers - who source the best meat from the South West. Our two multi-functional spaces are perfect for special occasions such as baby showers, birthdays and weddings, to business meetings, private dining experiences and everything in between. Our Mustard Room also features a private bar and state of the art AV system for meetings. We can tailor our food and drinks to your requirements. Whether it's a bespoke Tasting Menu, buffet, casual dining or afternoon tea, we will work with you to make sure your event goes down a storm with your guests. What's even better is that we don't have a room hire charge though if your event is at the weekend, there would be a minimum spend associated with the booking. After our sell-out tasting night in May, we're looking forward to being joined in the kitchen again on 30th August by MasterChef 2018 semi-finalist George Kallias. Since the show, George has been gaining some experience with us as well as developing some new dishes and tweaking some favourites from the show. Together with Head Chef, Luke and his team, George will treat guests to a five-course tasting menu. The proud Bristolian impressed throughout the competition with his modern take on Cypriot food, whilst using other influences from across the globe. Menu to be announced soon so watch this space! The five-course tasting menu is £40 per person, with an optional drinks flight at £25 per person. We only have a couple of tables left so to reserve the remaining places, please book online or call 0117 944 6444. Please note we take a non-refundable deposit of £20 per person to secure your booking. Please make sure you let us know of any allergies or specific dietary requirements in advance. Fancy a spot of lunch? During the week, we serve a special lunch offer where you can get 2 courses for £12 or 3 courses for £15. Perfect for a mid-week treat or even a working lunch. With a choice of starters, mains and desserts, you can expect some pub classics such as Beer battered haddock and chips and for those of you with a sweet tooth, we've got a tasty selection of desserts too. You can enjoy this offer in either our bar area, dining room or our outdoor terrace. View our sample lunch offer. Our standard menu is also available daily. Each month we hold a Tasting Night. This month we are celebrating summer (and what a Summer we're having!) so our Head Chef Luke has created a 5 course tasting menu to celebrate the very best flavours of summer. Tomato and red pepper Gazpacho. Cured mackerel & gooseberry jam. Heritage tomato, mozzarella & parmesan. Lamb rump served with peas, broad beans, baby gem & salsa verde. Lemon posset, Cheddar strawberries & hazelnut biscuit. To book please call us on 0117 644 9444. Last month we hosted the great Bristol burger-off between our very own Josh Eggleton, Luke Hawkins and Bristol's 'Burger Queen' Natalie Brereton. 'Josh Eggleton's sure got beef.. ' by Jess Carter. Josh's popular food pub The Kensington Arms has just launched a brand new burger night – and boy, did they kick it off with some drama. Enlisting the help of Bristol’s ‘burger queen’ (blogger Natalie Brereton, who we’re willing to bet you follow on at least one social media platform), The Kenny hosted a hotly contested burger-off last Thursday. Michelin-starred Josh and the pub's head chef Luke Hawkins got in on the action too, with each of the three creating a very different burger for the evening's menu. Guests each got to test out two of the gourmet burgers available (which were served with a starter, dirty fries, dessert and a flight of Bristol Beer Factory brews), and were given voting cards at the end of the meal to help determine which patty would triumph. An imaginative cuttlefish burger came in an inky black bun with a crisp Asian ’slaw and savoury peanut satay sauce, and a meltingly tender and lardy pork number was sandwiched with tangy pickled red cabbage to cut through the rich meat. The veggie option was a proper belter too – honestly. With a patty made from butterbean and cashew, it had a moreish savouriness and great crunch from chunks of nut. The winner of the night though, which was revealed once all the votes had been counted and adjudicated in the most rigorous and professional fashion (we imagine), was the beef. The meat was topped with soft flakes of ox cheek and crisp shards of pancetta, which punchy smoked Cheddar slowly melted into inside the comfort of the fresh, shiny bun. But who did the winning burger belong to? Natalie Brereton. Better luck next time hey, Josh? 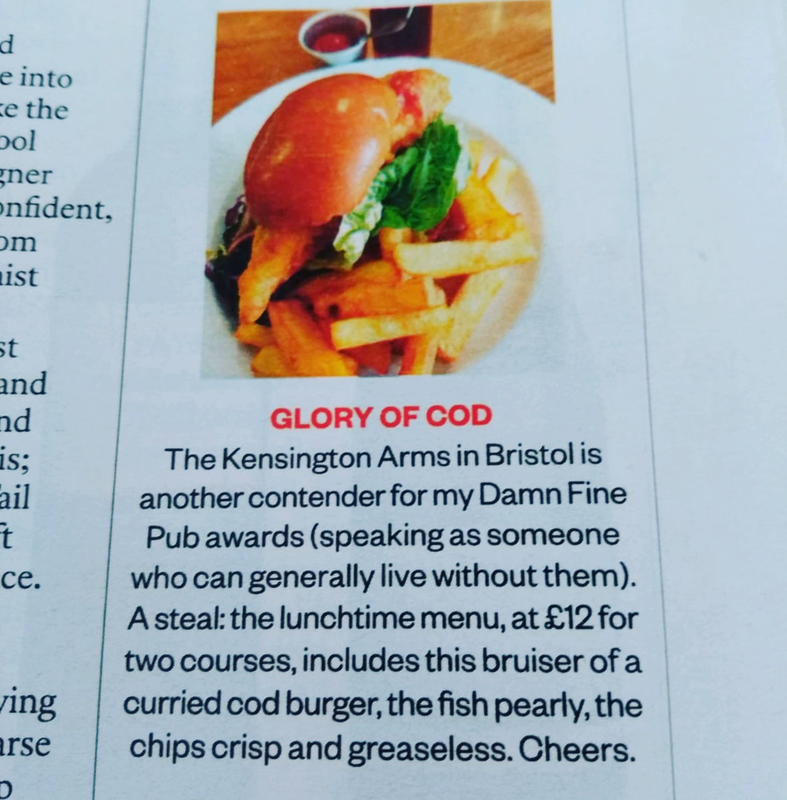 Although burger night at The Kenny won’t be quite as eventful as this on the regular, it will promise a burger with a side of dirty fries and a pint of Bristol Beer Factory Beer for £15, and is to be held every first Thursday of the month. Expect a choice of three burgers, with a new number appearing each month. Our next Burger Night is July 5th, 6 - 9pm. Book online or please give us a call on 0117 944 6444 to reserve a table.